– Understand the IP landscape. – Visualize key trends in IP and technology development. – List the major players and the relative strength of their patent portfolio. – Identify IP collaboration networks between key players (industrial and academics). – Identify current legal state of patented technologies. – Identify key patents by assignees and technology. – Identify blocking and valuable patents. – Overview of past and current litigations and licensing agreements. 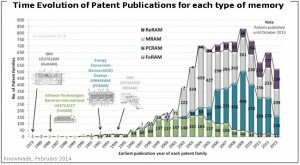 – Time evolution of patent publications and countries of patent filings. – Ranking of main patent applicants. 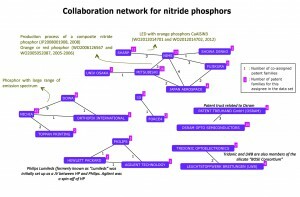 – IP collaboration network of main patent applicants. – Relative strength of main companies IP portfolio. – Main patented technologies of some companies. 2) An extensive Excel database with all patents analyzed in the study with technology segmentation. This patent database allows multi-criteria searches and includes patent publication number, hyperlinks to the original documents, priority date, title, abstract, patent assignees, technological segments and legal status for each member of the patent family.